See cool SpiceFX examples at YouTube! Apply these effects & transitions instantly; drag-and-drop onto the timeline like built-in Movie Maker effects and transitions! Our pre-made PACK presets are the easiest way to create fresh, unique visuals in Movie Maker previously possible only in expensive video editing software. Includes 600+ terrific effect & transition additions! 10 WIZARDS -- 3 NEW; ALL enhanced! Make CUSTOM titles, overlays, pan zooms, transitions and video effects for Movie Maker in one easy tool! Create the EXACT look you want, then one-click export as a built-in Movie Maker effect. The most POWERFUL way to enhance Movie Maker! New in v6: Adjust color, contrast, brightness, sharpness. Customizable film looks! Keyframing and many more improvements! 46 essential fixes to color, contrast, crop, etc. Handy effects for ALL digital movies. 99 pan zoom effects like Photo Story / Ken Burns. Mix/match pan zoom presets. 50 highlight effects with attractive frames & accents for your Movie Maker scene. 30 effects to make cartoon animation & abstract looks directly from video clips. 30 effects to selectively soften/sharpen, i.e. smooth skin yet retain hair detail. 30 cool film look effects to quickly create looks of big-screen movies, old film, etc. 30 motion ghosting, stop motion & time-delay effects ideal for sports videos, etc. 30 amazing high-impact flowing, organic distortion effects, water drop & blur fx. 37 ultra-soft dissolve transitions for Movie Maker -- a terrific pro touch! 54 cool picture-in-picture transitions that fly and hold a clip over another clip! 50 cutting-edge transitions -- organic, fire transitions, sweep transitions, etc. 36 'natural' transitions of wind/gravity effects to transition pixels off the scene. 58 amazing burst/drop/spill transitions for Movie Maker via particle effects. Movie Maker 6.0 is required for two Packs below. 60 page turn & page roll transitions; for wedding videos, family videos, etc. 41 unique 3D transitions that pivot, spin, swing, and twist away your clips. Contrast/brightness controls AND advanced color correction for Movie Maker! Set RGB amounts, saturation, brightness and contrast to fix any video/still (or make cool color effects). You can even vary the effect within the scene, such as to darken a bright sky. Cool! Complete control in Movie Maker over blurring and sharpening! Several blurs types are provided. Like the SceneFixer Wizard, you can vary the treatment within the scene, such as to blur only frame edges, or blur only a small area to obscure face identification. 200 professional presets for popular film looks. Each effect is adjustable for brightness, contrast and effect power. Save presets to create your own custom film looks! 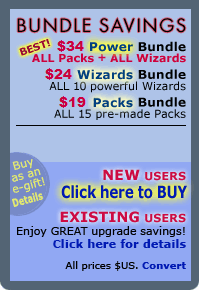 NOTE: This Wizard is a free extra available only with a Wizards or Power Bundle purchase. Create CUSTOM pan zoom Movie Maker effects (like Ken Burns). Drag frames visually to set start/end position, zoom amount, etc. EXACTLY as you prefer! Optimized for video or high-res still-images. This Movie Maker effect tool is one of our most popular! Drag Movie Maker titles/text ANYWHERE in a scene. Add new title animations, fade timing, text effects, etc. Greatly enhances Movie Maker's built-in titler; long-requested by users! 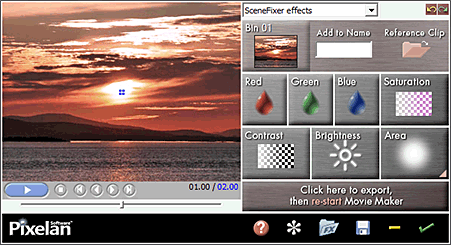 These Movie Maker effects integrate into Movie Maker's title animation dialog. Easily overlay and position in your Movie Maker scene any imported still-image, such as a logo, graphic, or frame. Then enhance it! It's like adding up to 6 new timeline tracks to Movie Maker for stills! Much easier than hacking Movie Maker with .xml code! Mix brightness, saturation, borders, etc. to highlight your main subject in wedding videos, event videos, soccer videos, football videos, etc. Version 6 has enhanced keyframing for the highlighting to follow a moving subject! Widely requested Movie Maker effect! Our long-popular industry-leading organic video transitions tool for Premiere, Vegas, etc. is now for Movie Maker! Easily customize the Movie Maker transitions by choosing shape, softness, border, etc. Make ultra-soft film dissolves transitions, etc. that pros use! Create custom picture in picture (PIP) transitions for Movie Maker, choosing the PIP shape, style, location, etc. Fly in and fly out video or stills from different directions over the background clip. A great tool for showing two clips together in Movie Maker! Download our demo to get the FREE, fully-functional TranJelly LE, which has dozens of customizable beveled transitions for Movie Maker. The full version has hundreds!